With that in mind, we want to know: are paperbacks still worth it? Have you published/do you plan to publish your book in both paperback and eBook form? How did you make the decision? When it comes to your personal reading habits, do you prefer eBooks or paperbacks? Do you think there will come a time when paperbacks are extremely rare/obsolete? Does a paperback book feel “higher quality” (in terms of writing) than an eBook? Are certain types/genres of books better suited for eBooks/paperbacks than others? Do eBooks/paperbacks offer unique marketing opportunities/challenges? We can’t wait to hear your responses! To join the discussion, please leave a comment below addressing any (or all) of the above questions. Also, mention the discussion to your indie author friends — we’d love to hear from everyone! I am doing print because it’s YA and many friends say that makes up 10-20% of their sales. But I can see being selective as to which ones I put into print. Laura, you bring up a great point. Maybe the choice of paperback versus eBook really depends on what genre you’re in. And you’re right that it’s all about selection. Thanks for chiming in! I have no plans for my first novel, but i would like to do a limited hardcover run if successful. Hey Matt, I think every author should publish a paperback at least once, just for the experience and the thrill of holding an actual product in hand. Doing direct orders through your website is a smart move too, especially if you’ve got the marketing tools to drive your traffic up. Get working on that novel! I was going to go with just an ebook with my first novel, but after encouragement from some friends I decided to do print on demand as well. I’m very glad I did since approximately 80% of my sales ended have been for print copies. Perhaps it’s just where I’m from, but almost everyone I know still prefers having a printed copy of any book they own. Christina it sounds like print really paid off for you, that’s great! If you have a good following it can definitely be worth it. I still prefer paperbacks in most cases, but I’m reading a few more books on my Kindle these days (when I’m not playing Angry Birds, that is!). Thanks for your comment! As a writer, I use createspace so there is print on demand for the reader and KDP for the ebook. That way readers have the choice of either ebook or paperback. As a reader, I prefer the paperback copies. Maybe I’m old fashioned or maybe because I don’t own an e reader, but have the kindle and nook apps on my computer and it’s easier to curl up with a paperback book compared to sitting here at the computer to read. The only thing I really like about the ebooks is they are usually cheaper and I can download them instantly. You’re right Karen, you can’t really go wrong offering both options. A lot of people are still buying paperbacks and there’s the added advantage that they are a little easier to share with others than eBooks. Thanks for sharing your thoughts! I plan to use CreateSpace to make paperbacks of my indie books available. But not until after my daughter’s wedding. Such a great point, Kelly. While paperbacks may be more of a burden on the author, they also help spread their work (and the love of reading) to a much wider audience. Congrats to your daughter, as well! For now, I don’t think we have much choice as indie writers: we need to have paperbacks available. There are quite a few readers out there who haven’t switched to eReaders for legitimate reasons: resale, sharing, etc., still matter to some people, and eReaders make those things complicated. Both of my books are available in each, and I imagine it will be so for the next few years at least. Honestly, though, I haven’t purchased a paperback since I got my Nook. I won’t be going back to physical copies. I think what’s important to keep in mind is that the ebook market is in its juvenile stages. The shape of the market is still shaking out. Technology is still developing, as are marketing techniques. It’s still the Wild West out here in indie publishing. It’s fun as hell, but the challenges are daunting, especially if you’re an indie writer looking for help formatting a book, cover, and epub, not to mention marketing. Thanks for sharing your perspective, Erik. You make some great points! I totally agree that we’ll need to keep paperbacks around because, while they’re more work, they introduce your work to a much wider audience than digital-only. Comparing the eBook market to the Wild West is genius — there’s still a ton of experimentation and upheaval, and it’ll be a little while before everything settles down. In the meantime, it’s the perfect time to jump in and be a part of the experiment. There’s not much to lose! I’ve released print versions of all my indie titles, to date. Romance readers were early adopters of ebooks, but they also like to buy “keeper” copies. The other reason for the print versions is for public appearances — conferences, panels, book signings. The only way to “sign” or sell electronic books at the back of the room or the book signing table involves investing in a couple of thousand dollars (Canadian) of electronics, that I’m just not in a position to afford. And I would prefer to wait until the technology is cheaper and the kinks have been ironed out. Eventually I perceive a time when I will cease publishing the print versions and only release in electronic formats. Tracy, thank you so much for sharing your experience and perspective. Having paperbacks for marketing purposes is a *great* point, and one I hadn’t even thought of, to be honest! They offer a much more personal touch that digital currently cannot match. I’m planning on initially going the route of Ebook and a limited number in paperback. I want to feel the book in my hands, see it on my shelf and be able to physically give it to my close friends and family. For sales purposes I think eBook is the way. There’s nothing like holding your book in your hands — getting to see, touch and smell it as a physical object. It makes the whole publishing process much more real! Thanks for sharing your thoughts, David! I’m doing both. 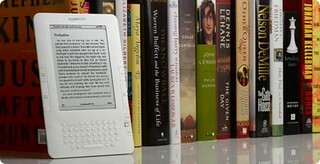 Readers seem to be very much one or the other and so to maximise sales, you have offer paper and e-books. Personally, I also prefer a “proper” book (unless I’m travelling for a long time and need several!) There’s nothing better than the feel of it and for that reason, I don’t think it will die out. In the same way as they said that home movies would make cinema a thing of the past, I think e-books and books are the same. I totally agree, Alex. I think paperbacks will always have their place, even as e-publishing becomes more and more popular. Thanks for your comment!